Here is a photo of a tufted duck (Aythya fuligula). The image is not that sharp because I had to crop heavily. 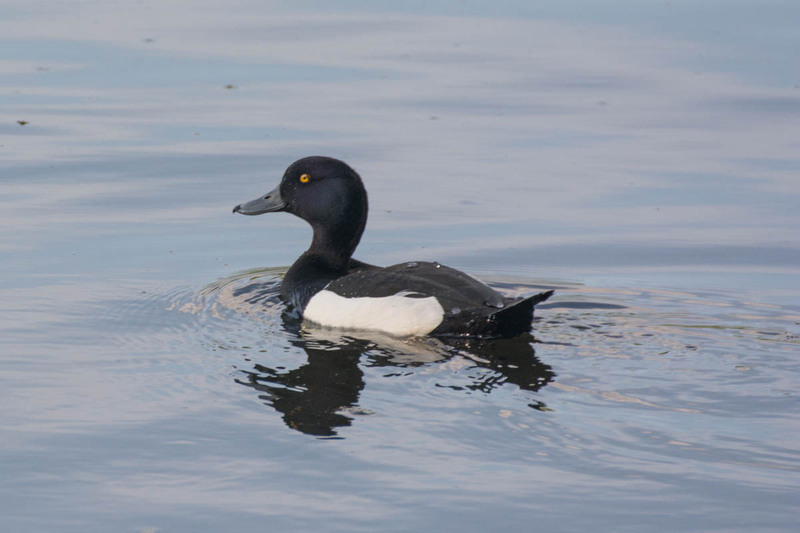 But I wanted to show the tufted duck anyway because I believe that I never did so on my blog. But I guess the image is not too bad, you can see the subject well. I believe I have some better photos of this species somewhere in my library, I will upload them in the future if that is the case. The photo was taken near a pond called Herrenteich in Reinfeld. My biggest lens in my arsenal is a 300mm lens too. I take these bird photos with a Tamron 70-300mm lens. I know what you mean, when it comes to birding, the focal length is never long enough. With 300mm I do still often have crop the images. As our both longest focal length is 300mm, your question is basically answered. With bird photography there is also a lot of luck involved. I had it happen that certain water birds were so close that I didn’t even had to use 300mm. And then you have days when you are out of luck and every bird is too far away. Generally I do crop my images quite often to “fill the frame” at least a bit. It’s not the sharpest image then, but on the other hand it’s about the subjects and if it’s clearly visible. I think a 300mm lens is very usable for ponds and smaller rivers… but it’s about going out often to get lucky shots. By the way… I am from Lübeck 🙂 I just hiked in Reinfeld often this year and it’s not too far away from my city. Schönen Gruss zurück! Ich war leider noch nie in der Schweiz. Das muss sehr schön sein bei euch!